Welcome to the August edition of Throwback Thursday! First, an important announcement: I am going to have a partner in sharing TBT. Andrée of Quilting and Learning - What a Combo! is going to be co-hosting with me beginning on the October edition. She'll host December as well.😍 I've got a couple of super-busy months in September and November, so this will ease the pressure, and it's always fun to share! Like me, or moi 😉, Andrée, is Canadian, a lover of learning, and a teacher. Runners, like cushion covers, are fast and satisfying makes. Here are two I made for my mum. The bottom one was made in 2000, and the top one in 2004. The bottom one was in a magazine. 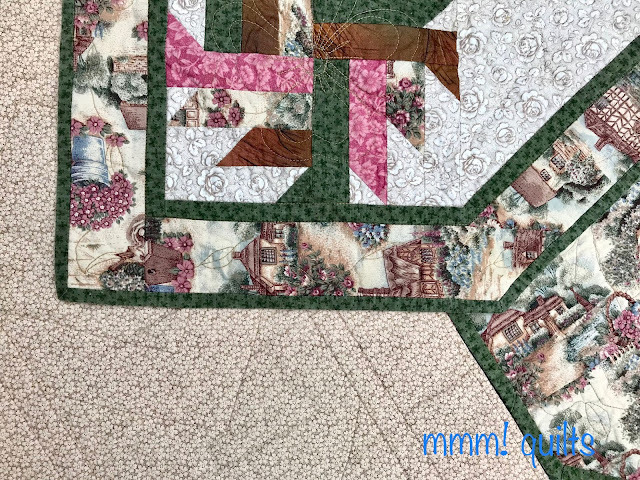 I've made at least three that I can think of using this pattern, which is not paper-pieced, but the log cabin blocks finish at 3.5", with the logs 1/2" each. It measures 13 x 33.5" and has been sitting on our kitchen table for the past two months. Yes that's the large beach glass bowl I made sitting on it, and hmm, more fodder for TBT in the two folded fabric technique coasters inside the bowl! I took them both with me yesterday on a lunch date to Viewpointe Estate Winery with two very dear, long-time friends. Quite the view, no? That's Lake Erie. Our table was next to this empty one. Yes, it's very dry here, as you can see from the yellowish lawn. 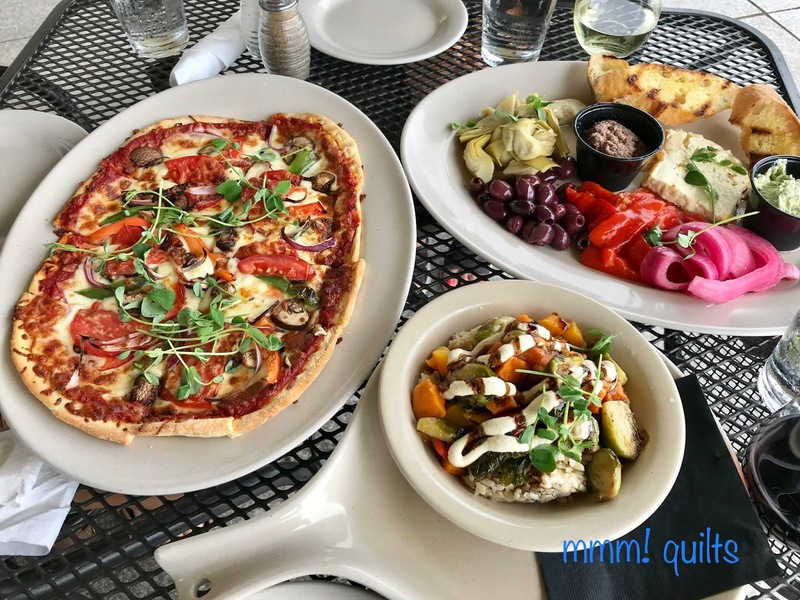 Quite the delicious food we enjoyed too al fresco of course! We ordered three different dishes to share and the computer split the bill evenly three ways. Perfectly shared! Of course a glass of wine went perfectly with these culinary delights! That's written with a Pigma Micron pen and has held up remarkably well! The fabric is showing slight fading on the front. This runner has been on my mum's kitchen table since the day I gave it to her, only being taken off in December for a Christmas one. 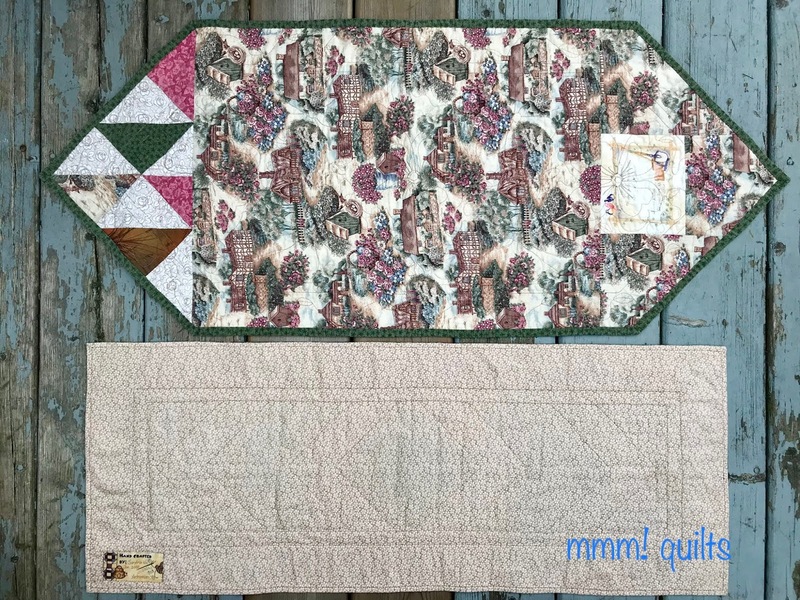 It was very well-loved, the second most-loved quilted thing I gave her, the first being her bag that she literally wore out, and so I made her another! When I saw the thatched cottage fabric in Fabricland, I knew it had to go home with me for a project for my mum! She's English, very much so! 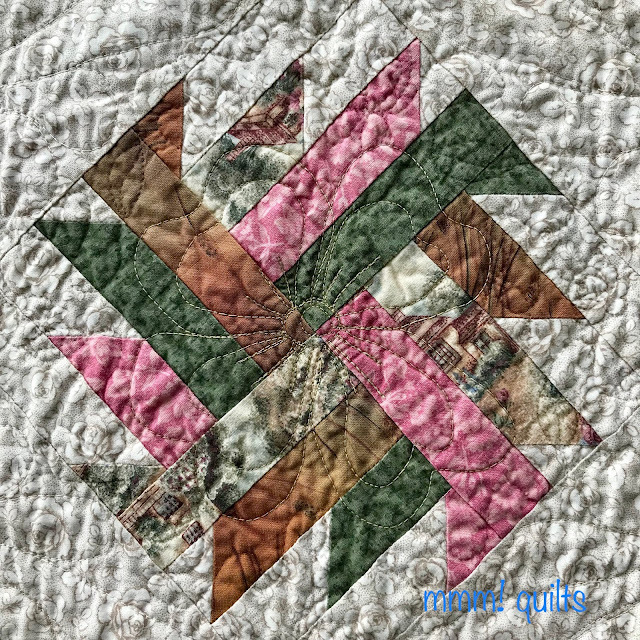 This one is three blocks, a free block pattern from Lori's Country Cottage, the quilt shop that transformed my sewing life into my quilting life. It's a pretty slick block. The setting is my own design. 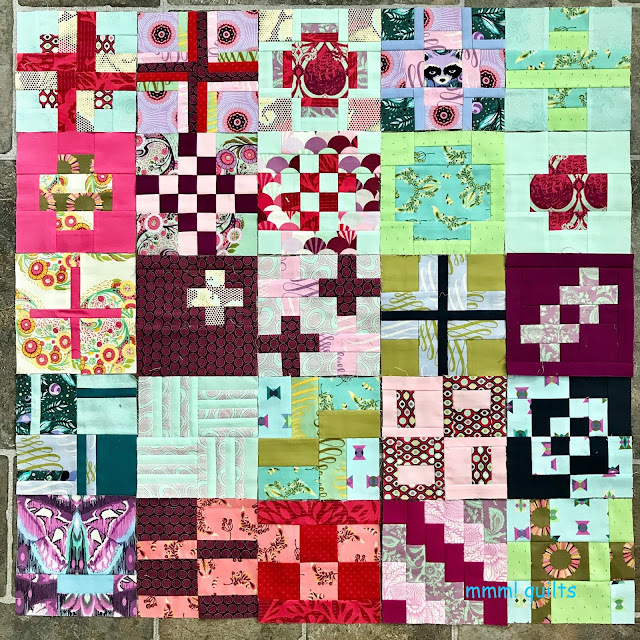 I should do it again in some bright colours for a kid quilt, I think! (if I can find it...) This one was made in 2004, and spent a good amount of time on the coffee table in her living room. You can see I did much more detailed quilting, FMQ here, thanks to finding Kathy Sandbach. I saw her on Simply Quilts, and bought both of her books. Gütermann or Mettler, but cotton for sure. Love the labels. Think they're all used now, saved them for special people, special quilts. 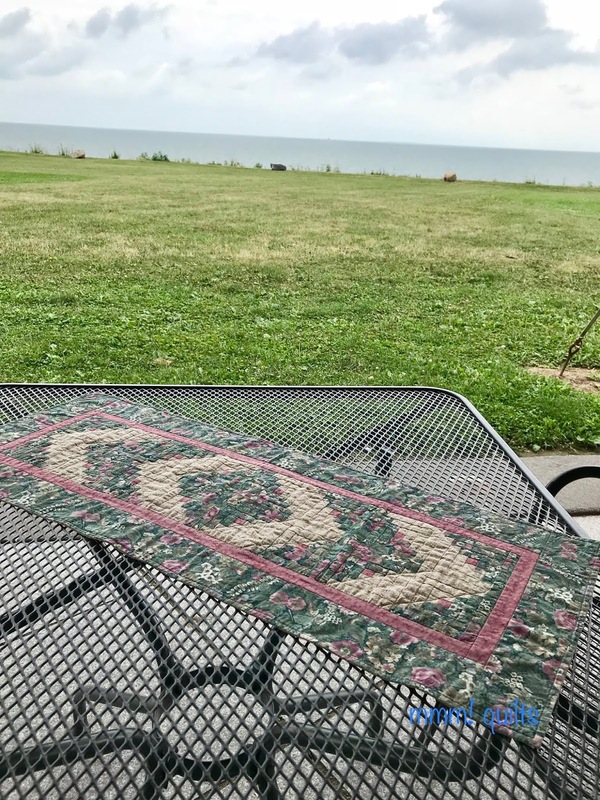 The first runner was simply stitched RST and then flipped right sides out, and the opening hand whip-stitched together, then top-stitched 1/4" around all four edges. This one has a binding, wider than I do now, machine-stitched to the front and hand-stitched down to the back. I believe it, too, has flannel or flannelette as batting, but it feels slightly thicker than the first one, maybe because it wasn't used or washed quite as much? It measures 16.75 X 40". Green was my mum's favourite colour, and her favourite combination was pink and green. Although seeing these gives me some sadness, seeing the first one over the past two months each day on my kitchen table has also brought me love: the love I sewed into every stitch, even just the finding and choosing of fabrics, and the love she had for me, and that I still feel today. Up until #26, I hadn't been paying too much attention to rainbow colours, just warm and cool. Might have to think a bit more for the next 25. 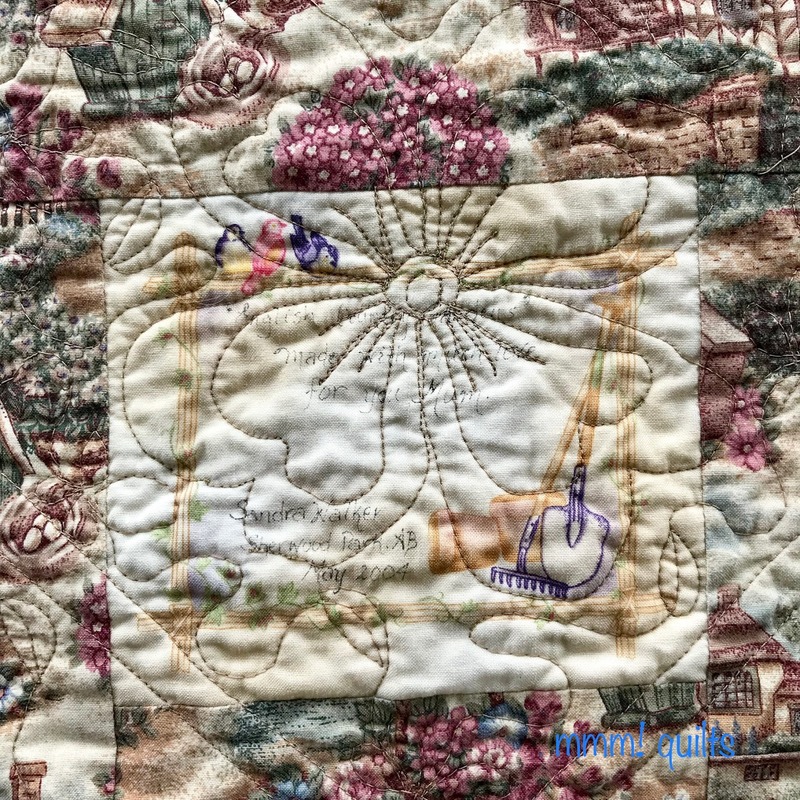 Looking forward, as always, to reading the stories that accompany your throwback to pre-blogging days quilts. I love that you took the table runners out for some new photographs with you, Sandra. It's wise to get some hosting help for the busy months; way to be kind to yourself. :) And congratulations on keeping up with the #100days100blocks2018 challenge: that is a big commitment! I bet your mom would be proud that her table runners were gracing the tables at the winery. What a lovely setting to show them off. 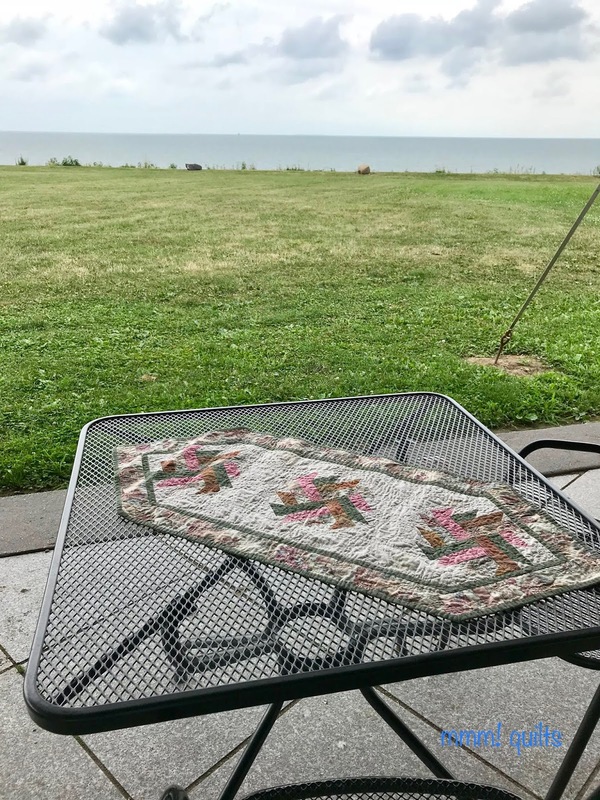 I love that you found the perfect cottage fabric for her. 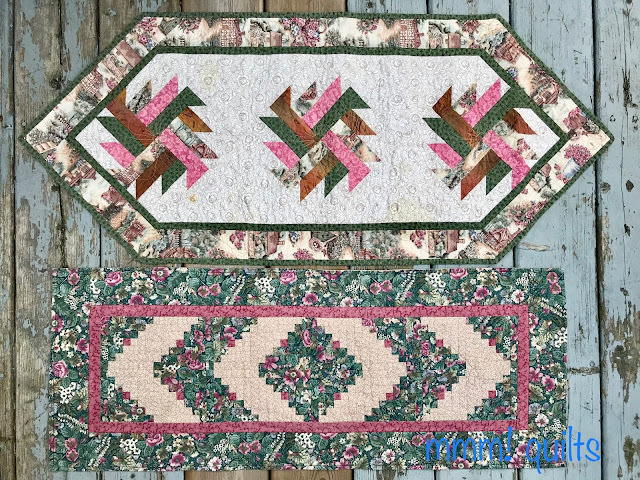 And, wow, your FMQ was genius even way back when. 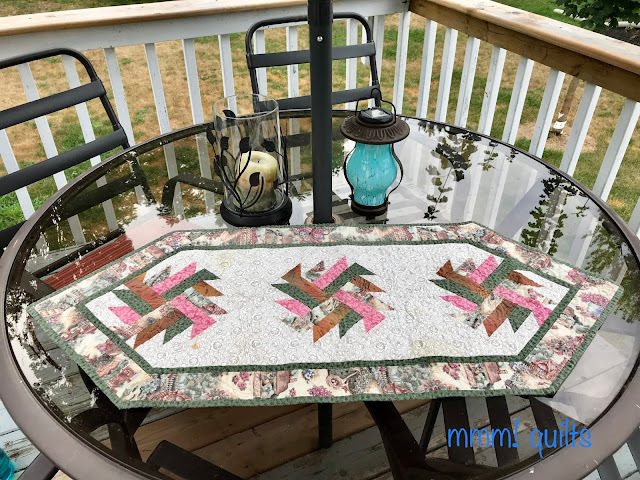 I think using everyday items that belonged to passed loved ones is a wonderful way to remember them, so I really like that you have one of your mom's runners on your table. Your 100 blocks (well, 25) are so striking together. I'm having fun watching the collection grow. What a great spot for lunch, with a view like that. Any view by water is fine by me. Your runners just seem to fit in that view too. So fun to see these. Thanks for sharing them, Sandra! Good job keeping up on the blocks too! I like your 100 days 100 blocks 2018 challenge blocks and the colours you are using. I'm particularly drawn to the maroon/red coloured blocks. I'm getting better at the linking up process. It's wonderful that you have these runners that you made for your mom. I have taken back a quilt top I gave to my aunt and also a cross stich that I made for my grandmother. It does help you remember the love that you had for in your case your mom and the love which she had for you. Your 100 blocks are looking gooood! Love the table runners and how nice that they got to enjoy the Lake Erie view. Hi Sandra, it's great that these two runners were so loved. Your blocks are looking great! 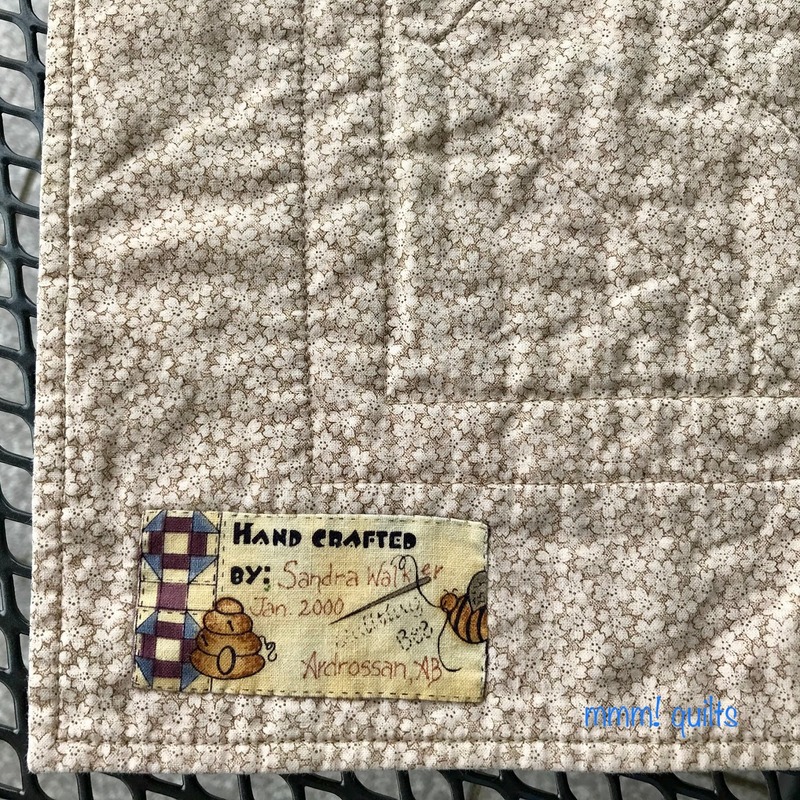 Sandra, even back in the early 2000's your quilting was beautiful! And, nice going on the 100 blocks! You have always been a wonderful Quilter, Sandra! Just look at that beautiful work! 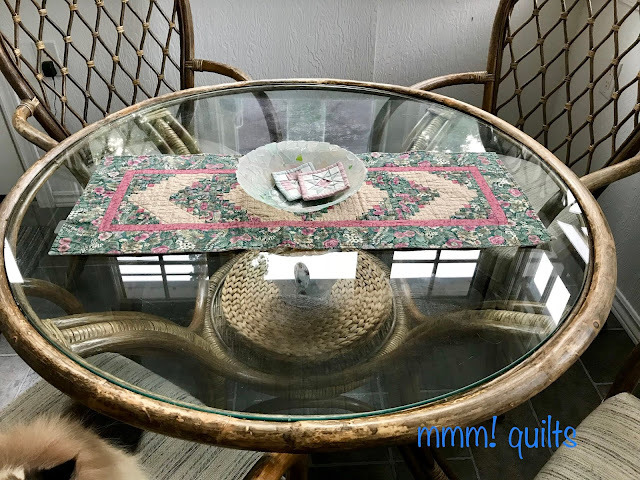 What fun memories reside in those table runners. It's always the best to see what you made in use. Lovely runners and the colours in your 100 blocks are so vibrant. So nice to see and hear how loved these runners were by your mom. Using a gift is a great way to show appreciation.